Is the management of documents throughout your business in a bit of a state? Do different departments or even individuals structure their online filing systems differently making the location of documents difficult to find? Do you long to have all documentation about any one project â€“ including emails â€“ in one place? Here at DataSpace UK we have just the solution you are looking for! 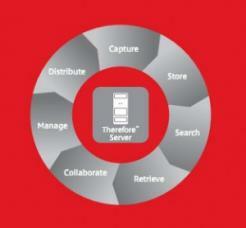 We work with Canon UK’s Thereforeâ„¢ document management system. This electronic or digital document management system streamlines business processes and speeds everything up. Therefore â„¢ can ‘capture’ documents from the desktop and include email. The system is easy to use and requires little training so it shouldn’t cause problems for your staff. Whatever format your document is in â€“ word, image, report – Thereforeâ„¢ can cope with it and add it to the file. Thereforeâ„¢ has ‘permission based’ access which is easy to implement and also allows the administrators to see who has looked at what; it means documents are easily accessed by all who need them. This can be rolled out not just over in-house departments but in branch offices too. Other equipment can be linked up to the system so that documents can be stored i.e. scanners and multi-function printers. We think, Thereforeâ„¢ it works! If you want to learn more about EDRM Thereforeâ„¢ please give DataSpace UK a call on 0800 028 8956; our team of professionals will be happy to go through its attributes with you.